Share the post "Rutgers-Led “Tick Blitz” Finds Exotic Longhorned Ticks and Aggressive Lone Star Ticks in New Locations Across New Jersey"
The May 10 “Tick Blitz,” led by the Rutgers University–New Brunswick’s Rutgers Center for Vector Biology, revealed new information about the distribution of longhorned ticks, lone star ticks and American dog ticks in New Jersey. James Occi, Rutgers Center for Vector Biology. Findings will help state, partner agencies check the spread of tick-borne diseases. Researchers at Rutgers University–New Brunswick’s Rutgers Center for Vector Biology have found exotic longhorned ticks in four New Jersey counties – and confirmed that these northeast Asian ticks have been present in the Garden State since at least 2013. The new detection of these ticks in Mercer County was made through the first-ever statewide “Tick Blitz,” led by Rutgers–New Brunswick in collaboration with all 21 county mosquito control programs. The Tick Blitz also provided new data on two native tick species. Researchers found that lone star ticks have expanded further north within New Jersey. The researchers also, for the first time, mapped the statewide distribution of American dog ticks. The findings provide Rutgers–New Brunswick, the U.S. Department of Agriculture, the state departments of Agriculture, Health, Environmental Protection, and county mosquito control programs with valuable information as they work together to check the spread of tick-borne diseases. Rutgers–New Brunswick developed the Tick Blitz in collaboration with the Monmouth County Tick-borne Diseases lab. After an earlier training workshop taught at Rutgers EcoComplex, representatives of each county mosquito control program, aided by Rutgers students and employees of the State Department of Environmental Protection’s Mosquito Control Commission, collected ticks on May 10 at pre-determined locations across each New Jersey county. The Rutgers Center for Vector Biology examined all ticks caught statewide, and sent specimens of the exotic longhorned tick to the USDA’s National Veterinary Services Laboratory (NVSL) for confirmation. Rutgers–New Brunswick is further examining ticks of all species found during the Tick Blitz to determine whether they carry microbes capable of causing disease in humans. Rutgers–New Brunswick’s New Jersey Agricultural Experiment Station provides information on how people can protect themselves, their children and their pets against tick-borne disease. Longhorned ticks (Haemaphysalis longicornis). The Tick Blitz found this exotic species in Mercer County, where it had not previously been discovered, as well as at new locations in Hunterdon, Middlesex and Union counties, where it had previously been found. Separately, the Rutgers Center for Vector Biology confirmed that longhorned ticks, which are native to northeastern Asia, have been present in New Jersey since at least 2013. The lab determined this through DNA analysis of a tick specimen collected from a dog in Union County during the spring or early summer of 2013. This finding was also confirmed by NVSL experts. Longhorned ticks have also been found on cattle in Virginia and West Virginia. 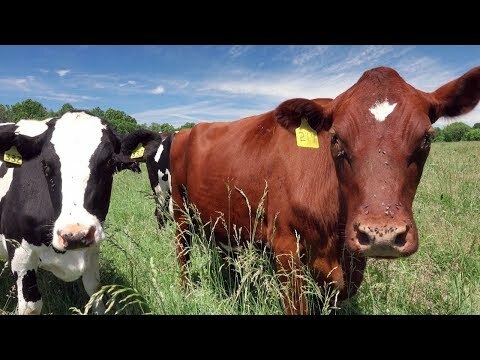 Their presence is primarily of concern to livestock farmers as this species is known to develop large infestations that can damage meat and milk production even in the absence of pathogens. The longhorned ticks found in New Jersey have not, thus far, been found to carry pathogens or to bite people. In its native range in Asia, however, this tick has been known to infect humans with diseases, including some known to be deadly. Lone star ticks (Amblyomma americanum). The Tick Blitz found this aggressive, human-biting tick to be abundant at several sites in Middlesex County. They had previously been found to be abundant only as far north in New Jersey as Monmouth County. This species, native to North America, is the primary vector of ehrlichiosis, a bacterial disease that typically causes fever, headache, fatigue and muscle aches. Its bite has also been known to cause alpha-gal meat allergy, which causes an allergic reaction to meat and meat products. The species is named for a white, star-like spot visible on adult females. 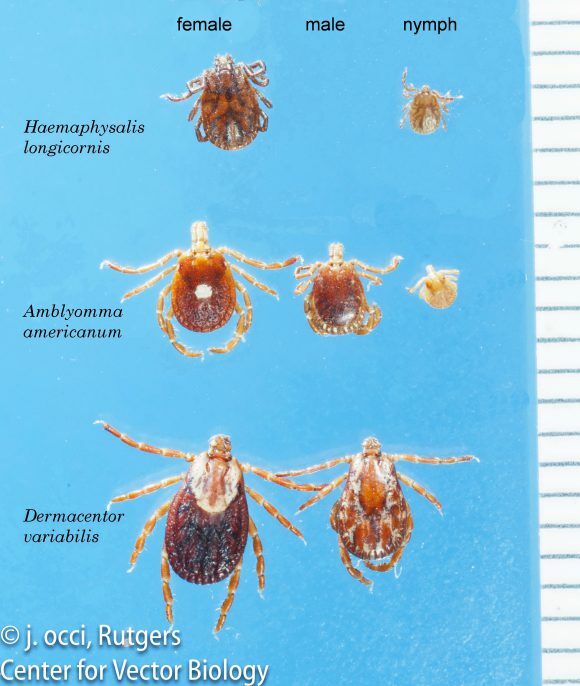 American dog ticks (Dermacentor variabilis). This native species can spread Rocky Mountain spotted fever, tularemia and other diseases to humans. The Tick Blitz found American dog ticks widespread across New Jersey which, though not a surprise, provides the first-ever statewide map of this species.